Provide comfort for the family of Hazel Rulison with a meaningful gesture of sympathy. 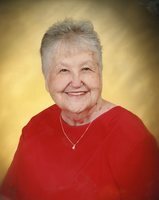 Ms. Hazel Maxine Rulison went to be with her Lord and Savior, at the age of 95, on Sunday Jan. 27th, 2019 at the Carriage House in Sulphur Springs, TX. She was born in Van, TX on Oct. 7th, 1923, the daughter of the late John and Vera Word Schetlock. Hazel was a member of Pine Street Baptist Church and the Fididelis Class. She witnessed to everyone she came in contact with whether at home, church, hospital or the Carriage House by giving them a copy of “Fingerprints,” a poem she wrote. She was preceded in death by her parents, John and Vinnie Schetlock, her loving husband, Ernest Edward Rulison, son; Edward Rulison; grandson, Rodney Ritchie; granddaughter-in-law; Laura Ritchie; grandson-in-law; Rein Schilten; sisters; Dorothy Walters and Mary Hunter and brothers; Bill and JD Word. She is survived by two daughters, Carolyn Sue Sword and husband, Vernon of Kingwood, TX and Wanda Maxine Ritchie and husband, Bill of Mt. Pleasant; two sons, Ernest William Rulison and wife, Kathy of Winnsboro and Kevin Lynn Rulison of Longview; grandchildren, Jeffrey Ritchie and wife, Amanda of Mt. Pleasant, Michael Ritchie and wife, Louise of Houston, TX, Tabitha Bielawshi of Dallas, TX, Charlotte Schilten of Kingwood, TX, Kristina Sons and husband, Danny of Montana, EJ Rulison and wife, Laura of Winnsboro, Melissa Martin and husband, Travis of Santa Fe, TX; sisters, Shirley Caldwell of Ohio, Melba Woodby and Betty White of Michigan. She is also survived by fourteen great grandchildren, numerous nieces, nephew’s other family and many friends. In lieu of flowers, donations can be made to Pine Street Baptist Church Building Fund, 611 West Pine St. Winnsboro, TX 75754.
eyes and made him see. and caused the dumb to talk. that He still touches us. To send flowers in memory of Hazel Maxine Rulison (Schetlock), please visit our Heartfelt Sympathies Store. We encourage you to share your most beloved memories of Hazel here, so that the family and other loved ones can always see it. You can upload cherished photographs, or share your favorite stories, and can even comment on those shared by others. Craig, Jody and Aileen sent flowers to the family of Hazel Maxine Rulison (Schetlock). Deepest sympathies, till we see you in Heaven, From Craig, Jody and Aileen. 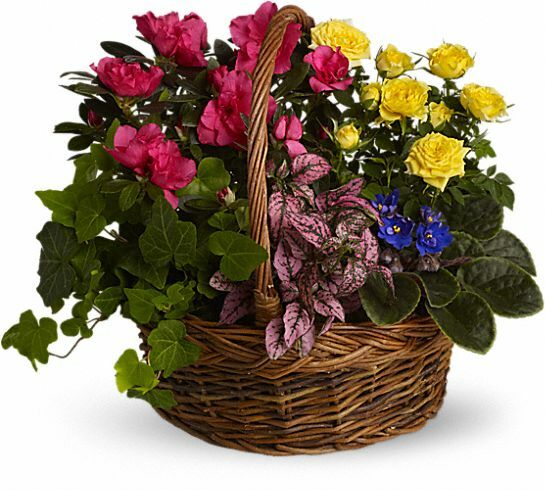 Craig, Jody and Aileen purchased the Blooming Garden Basket for the family of Hazel Rulison.